Formed with Brandon C. Smith and now in our ninth year of engaging in collaborative projects, SmithTownsendCollaborative presents view of the big nothing from an abandoned perch atop pink meat pod island (with Godbird watching). As we've done before, we've overlapped our visual languages to try to create something that neither one of us would make on our own. And this work picks up on some of the narratives our past projects have suggested while attempting to thoughtfully contribute to the exhibition's theme put forth by LAL guest curator Georgia Henkel. 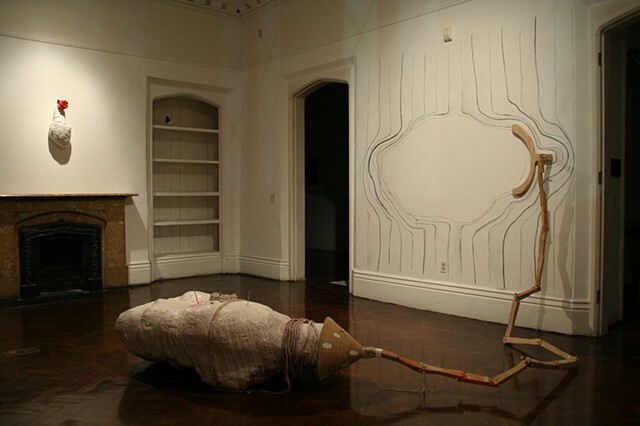 The wall-drawn component connects via a long hinged wooden "chain" to a rather largish pinkish meaty-looking pod of Brandon's creation. On top of the pod is a lonely little remnant of a brick house with an empty chair in it. The chair views the big empty blob on the wall as Godbird (the strange-looking painted bird sculpture) watches from his high perch on the wall. There are some other components, too that add to the narrative possibilities. So, not love of emptiness or fear of emptiness so much as just normal, kinda dumb, lonely-human-on-a-rock-in-a-big-void kinda emptiness.